Another year, another enjoyable NAFSA conference! This year’s conference took place in San Diego, California and attracted 9,937 participants. 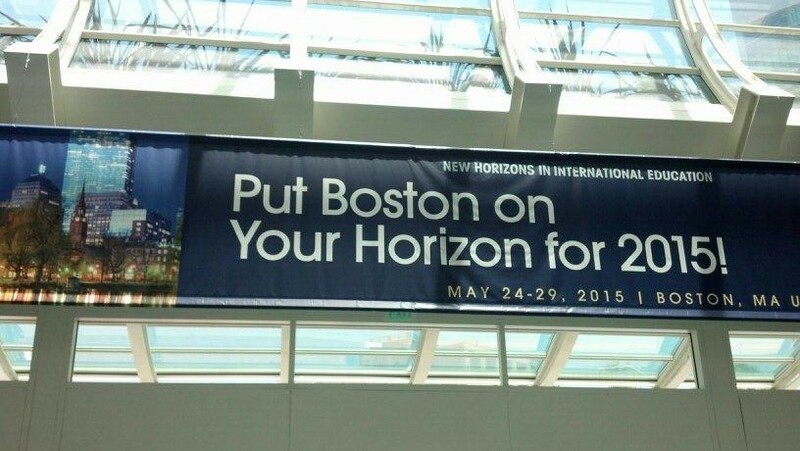 I heard rumors that it was the biggest NAFSA conference ever. I’m not sure if that point has been verified, but it was definitely clear that there were many “NAFSAns” roaming the halls of the San Diego Convention Center last week! Reflecting on the past week, I realized that everything I liked about the conference can be categorized into five groups. So, let’s take a look at my Top 5 List for elements I loved about NAFSA 2014! I normally don’t care too much about the conference location (come on, I didn’t think St. Louis was THAT bad! ), but even I had to admit that San Diego was a great choice for this year’s annual conference. The city’s warm temperatures, coupled by cool breezes, were refreshing for those of us traveling from locations that had lingering winters. The location was also very convenient! The San Diego Convention Center is near many hotels, restaurants, and other services, so it was very easy to grab a quick bite, run a fast errand, or to slip back to your hotel when necessary to do some work. Beyond that, there was a very important added convenience for those of us who are coffee-lovers: there were many Starbucks stores located inside and all around the center! 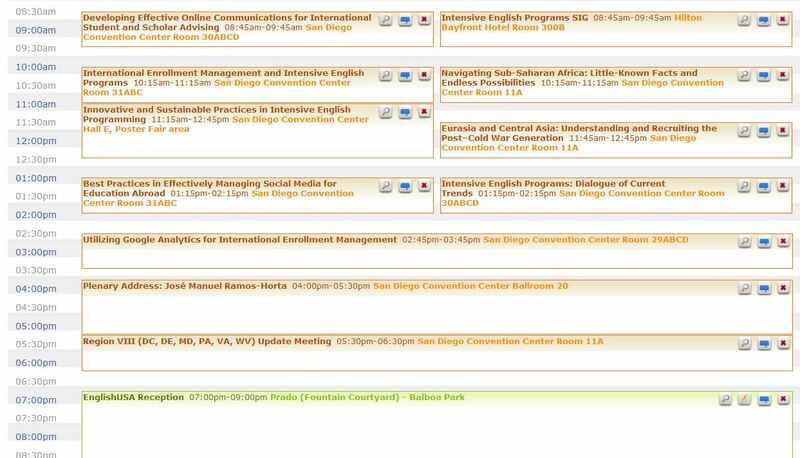 The convention center also offered free WiFi internet access, facilitating communication among NAFSAns (check out #NAFSA14 on your Twitterfeed to see for yourself!). My conclusion: Maybe we should consider making San Diego the permanent home for the NAFSA annual conference! This was actually a light load, as my employer sent a large delegation to NAFSA this year and we were able to split up the activities. Personally, I enjoyed the BMI Brazil reception and the EnglishUSA reception the most, as the attendees have goals in student Admissions/Recruitment and in ESL Program Administration that align more closely with my own, making for great conversation and wonderful new connections. Every year, I feel that it is becoming increasingly difficult to choose which sessions to attend. I usually seek sessions that focus on recruitment, and I also tend to prefer the Practitioners’ Toolbox sessions. There were so many good sessions this year that, when I first started building my schedule, it was a disaster (see image below)! This year, there was so much to choose from that I actually brought my graduate assistant to the conference with me so that I wouldn’t really miss anything! They provided a good combination of lecture-style sessions and workshop-style sessions. I learned a lot, and even found some strategies that I can implement immediately in my work. This year, some of the burning questions I had prior to attending NAFSA were related to several sponsor programs, particularly the Brazilian Scientific Mobility Program (BSMP) and the scholarship programs (in coordination with the Iraqi Cultural Office in Washington, DC). Thankfully, there were several useful sessions available on these, subjects, and the sponsors all had booths in the Exhibitor Hall, as well. I really have to commend the Institute for International Education (IIE) on their availability to NAFSAns this year for discussions about the scholarship program. Besides manning a booth in the Expo Hall, they also were available in at least one large session for all NAFSA participants who were interested, as well as in a small session that was just for members of the Consortium of University and College Intensive English Programs (UCIEP). We were able to get updates about the program and to learn about the future of the program as they see it (there is a lot of uncertainty about its future due to the upcoming Brazilian presidential elections in October). In addition, participants were able to ask IIE representatives for clarification about policies and other important elements about the program. As one of the people who oversees the BSMP students who study in our IEP, this was very useful for me. The other sponsored programs that I became very excited about at NAFSA were the Iraqi scholarships. This year, Lorna Middlebrough from the Iraq Cultural Office came to NAFSA again, along with representatives from Iraqi Federal Government and the Kurdistan Regional Government, as well as a representative from an American university that has been very successful in recruiting the Iraqi students. The Iraqi session was so interesting! I was surprised to know that there are many students there who have been awarded scholarships for study in any area (of course, with preference on STEM fields) who simply have not yet been able to be placed in a university overseas. They literally have a scholarship in hand with nowhere to go. There is a lot of great opportunity there! In the Iraqi session, I also really enjoyed the frank talk from the American university representative on the panel. He spoke very plainly about the challenges that Americans face when recruiting overseas in comparison to our British counterparts who have managed to be very creative, flexible, and responsive with Iraqi student applications. It is no wonder that most Iraqi scholarship students go to the United Kingdom. He really brought home the point that US schools need to get it together when it comes to dealing with international students across the board, not just from Iraq. We had a terrific poster presentation for innovative and sustainable practices for IEPs with a lot of great ideas for providing improved and interesting services to our student body. Overall, this was a great NAFSA for IEPs. Kudos to the leadership of EnglishUSA for encouraging so much participation from our peers. Overall, it was an exciting and useful week. I’m so happy that I participated. As usual, I came away from NAFSA with a lot of fresh ideas, a feeling of affirmation for the success and popularity of the strategies that we are implementing at our IEP…and, of course, I came away with a ton of follow-up work!